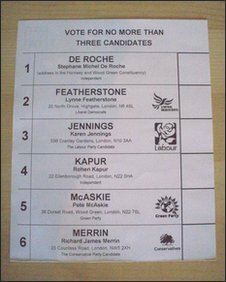 A north London council has recalled 749 postal ballots which asked voters to pick three candidates instead of one. Haringey Council has since apologised to the voters for the blunder and has had to deliver new papers by hand. A spokesman said: "We would like to apologise to the voters, candidates and parties affected by this error." Student Ruth Whincup, who received the incorrect document, said: "I was surprised. What if others didn't realise it was a mistake?" She added: "I rang the local council and they confirmed my suspicions and they said it was a mistake and said they were going to try and get new voting forms out to everyone. "But I just thought it was shocking that they hadn't tried to make it more public to stop people from voting incorrectly in the first place." Haringey Council hand-delivered the correct ballot papers along with an explanatory letter on 29 and 30 April to each address that had been affected. It has told voters to destroy the erroneous papers. Independent: Stephane de Roche; Liberal Democrat: Lynne Featherstone; Labour: Karen Jennings; Independent: Rohen Kapur; Green: Pete McAskie; Conservative: Richard Merrin.